San Francesco is a popular site for a camping holiday with a wide range of amenities. It is located in the Lombardy region of Italy, on Lake Garda, and is the perfect destination for sun-seekers. With outstanding views of the lake, and entertainment for the whole family, this is the perfect environment for luxury camping; you can rent an upmarket mobile home and spend your holiday in comfort. Why is San Francesco LUX-camp the Best Campsite for Your Holiday? As well as being right by the lake, San Francesco is surrounded by activity centres and other tourist attractions. There is a golf course within 10km, and mini golf and thermal baths within 4km. For horse lovers, there are local riding stables nearby, and sailing and surfing equipment can be found close to the campsite. San Francesco is a site that really caters to your little ones. There is a children's play area on site to keep them occupied during the day; and to provide parents with a well earned rest! There is bike hire, table tennis, and volleyball all available on site, perfect for active families who enjoy spending time in the great outdoors. There is children's entertainment during the day and at night, and there's even a mini petting zoo! 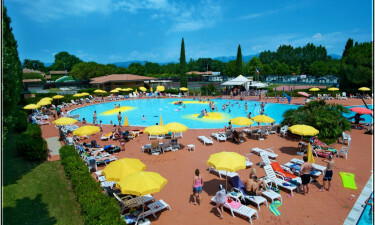 As San Francesco is a luxury camping site, there is a wonderful large pool area that is great for both kids and adults. The pool is large enough that it won't ever feel crowded, and there are plenty of sunbeds to go round; it's the perfect place to relax with a cocktail. 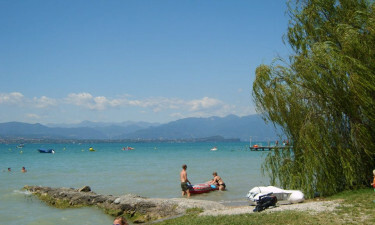 More adventurous swimmers can even go for a dip in the lake, which is just a few meters from the campsite. There are several bars and restaurants available on site. Traditional Italian food is the main offering, with delicious fresh pasta and pizza being served daily. There's an ice cream parlour and a yoghurt bar, ideal for keeping cool during the hot midday sun. At San Francesco holiday camping site there are several different shops, so that you can but your groceries with ease. There is a supermarket for all your essentials; from bread and milk to fruit and vegetables. Additionally, there is a fishmonger selling freshly caught local fish, and even a sweet shop to satisfy every sweet tooth.